To get a better sense for what to expect, read below for general information about the symposium, oral and poster presentation sessions, and glimpses of past symposia. 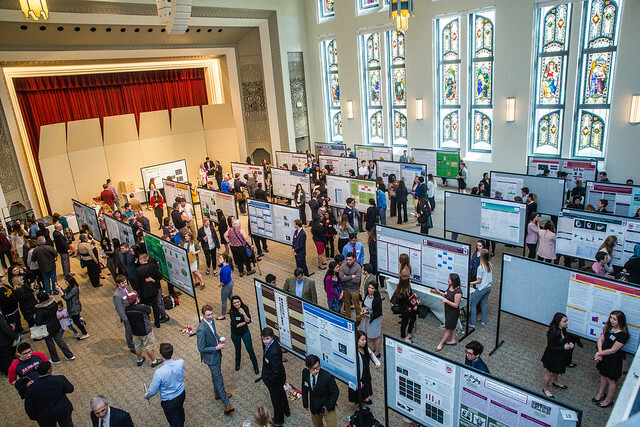 Poster sessions are the largest component of the symposium and feature student researchers and community engagement projects from across the disciplines. The 2020 symposium will feature two poster sessions with each session lasting 90 minutes in Mundelein Auditorium. Students will be assigned to present in either the morning or afternoon poster session (but not both) and are expected to be present for the full session. During the session, students visually display their research or community engagement projects, deliver brief presentations on their projects, and answer audience questions. Registration for the 2020 Undergraduate Research & Engagement Symposium will open in Fall 2019. If you are planning to become a presenter, you can find more detailed information, guidelines, and resources for creating, submitting, and printing your poster here. Registration for the 2020 Undergraduate Research & Engagement Symposium will open in Fall 2019. If you are planning to become a presenter, you can find more detailed information, guidelines, and resources for creating, submitting, and printing your poster . An awards ceremony will follow the oral presentation and poster sessions. You can find more information about these awards and how to nominate students, staff, faculty, and community partners on our awards page. Check out this slideshow featuring the 2017 Undergraduate Research & Engagement Symposium and other events from Loyola's 2017 Weekend of Excellence. Do you have more questions about the symposium? Please visit our Frequently Asked Questions page.